You are currently browsing the tag archive for the ‘X’ed Out’ tag. Today’s review is somewhat shorter, but then it is my wife’s birthday, so you’ll allow me this one won’t you? As it happens I have chosen the latest book from the master of disturbing imagery – Mr Charles Burns, creator of the seminal Black Hole. If you have not heard of him and are interested, I envy you not just the chance of discovering this great artist for the first time, but also being able to walk into a bookstore and pick up the collected edition of Black Hole. Fans of the book had to wait a year between issues as Burns balanced his time working on this story of teenagers in the seventies enduring a disfiguring disease known as ‘the bug’, with commercial advertising. There is also a movie based on Black Hole on the way. Now that is something I am very eager to see. X’ed Out retains some of that previous work’s themes – disaffected teens, drug use – but Burns also mashes up two very diverse sources, namely Tintin creator Hergé and William Burroughs’ The Naked Lunch. 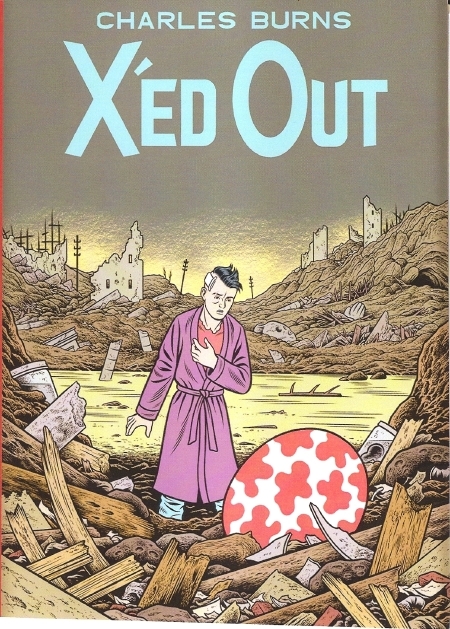 As you can see below, the cover of X’ed Out is a riff on the Tintin adventure titled The Shooting Star (apparently a favourite of Burns’), here with giant eggs standing in for the alien mushrooms of Hergé’s tale. Doug is a young man suffering from a series of disturbing dreams. He finds himself in a bedroom with no memory of how he got there. There is a large hole in the wall of this room. His dead cat appears and leads him out through the hole into a barren wasteland covered in refuse and sewage. Attempting to follow his former pet he finds himself in another building that appears to be storing a collection of giant eggs. There he is confronted by a green reptilian man, who ejects him from the building into a street that resembles downtown Cairo, or Tunis, populated by weird and monstrous looking denizens. He drifts in and out of the dream, occasionally flashing back to a period in his life when he met a fellow artist named Sarah, who expresses herself through unusual photographs hinting at feelings of self-loathing, or disgust. 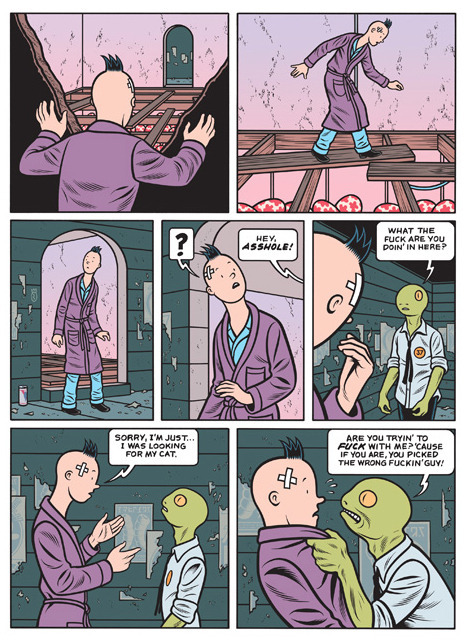 Doug himself attempts to perform beat-style poetry using the stage name Nitnit, homaging William Burroughs’ cut-up technique and wearing a plastic mask that resembles a punk-Tintin. These events appear to be happening in the early nineties during the grunge-era with its revival of interest in punk icons like Patti Smith, as well as beat poetry and a return to experimentation in the arts. Doug is also medicating himself with antipsychotics of some kind and is seen eating pop-tarts. The events of his past begin to bleed over into his dream, his own personal Interzone. In this world Doug resembles a black dye-job Tintin, his Nitnit character come to life. He sees Sarah there also, transformed courtesy of the Hergé aesthetic from a troubled young woman with white scar lines along her arms into a beautiful princess. This is the first in a new series by Burns, with each chapter published in the hardback European style. It is a dark fantasy, with an abiding sense of creeping horror waiting within its pages. I could be trite and say it is perfect Halloween fare, but I am not prepared to wait until October 2011 for the next book. I want it now!